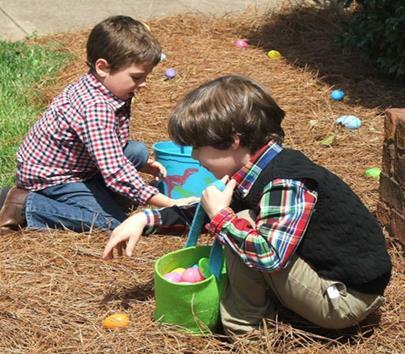 Our annual Easter Egg Hunt for the little children will be held after worship on Palm Sunday, April 14. 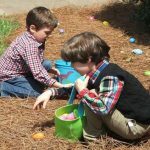 There will be a light lunch followed by a variety of games and the egg hunt on the lawn! In the event of bad weather, the egg hunt will be held indoors. 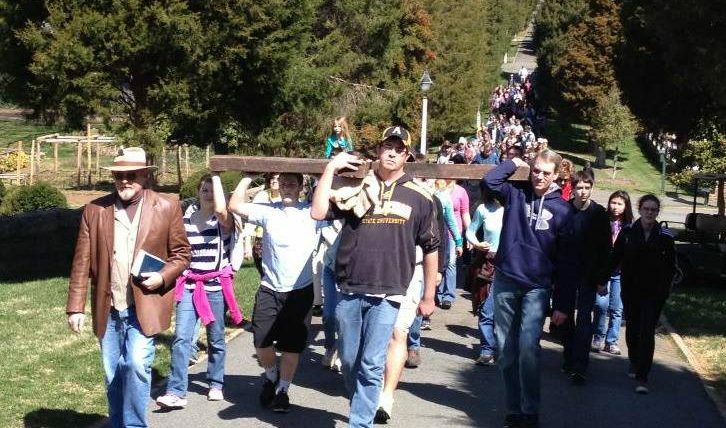 For forty-four years, the youth of Trinity Moravian have held a Cross Walk on Good Friday. A full-size cross is carried in solemn and prayerful silence through downtown Winston-Salem, concluding at Salem Square with a liturgy of confession recalling Christ’s crucifixion. As we have for the last several years, the Cross Walk will start at LOAVES & FISHES, 657 West 5th Street, the Building across the street from the Downtown Library. Parking is available in the Centenary UMC lot next to Loaves & Fishes,. Please arrive between 10:30 am and 11:00 am. The Walk will begin at 11:00 promptly. The route is about 1.4 miles in length. We walk slowly so that the walk will take 40 minutes or more; because of our alternate route to accommodate I-40 construction, it may be a little longer. We conclude at Salem Square, where Walkers will be greeted by a Moravian Band, and together we will join in a Good Friday Liturgy of Confession. Visit the Cross Walk page to see the alternate route map! We usually have between 6-8 people carrying the cross together at any time. Everyone who wishes to take a turn will have a turn. This is not a “reenactment,” but a meditational prayer experience and silent witness. ALL ARE WELCOME. We often have babies in strollers, walkers with dogs (MUST BE ON LEASH! ), and even folks in wheelchairs. Those who do not feel that they can physically do the mile walk are welcome to join us at the end at Salem Square – and in fact we often have quite a crowd waiting there when we arrive! Walkers are advised to bring some bottled water, sunscreen, and hats! We will be escorted by two Winston-Salem Police Officers who will supervise street crossings. A church bus will be available to shuttle Walkers back to the parking lot on 5th Street after the Walk is concluded. Last year, we had a record number turn out, with over 250 Walkers. This year we are hoping to have an even larger number! It is hard to describe the experience of the Cross Walk. Like many of the best Moravian worship traditions, it is experiential in nature. Each year more and more people from different walks of life join us for this solemn procession. 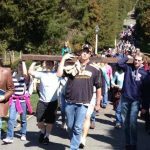 Children, teens, grandparents, recovering addicts, ex-convicts, bishops, and ministers take turns carrying the weight of the Cross. The silent, reverent procession is a time of personal prayer and reflection. Each person takes something different away from the experience. 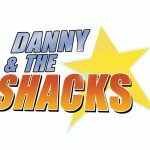 Danny & the Shacks is a puppet musical presented by our Logos Middle School puppet team retelling the Bible story of Daniel and Shadrach, Meshach & Abednego in the land of Babylon. These captive Israelites held true to their faith while captive in a foreign country. They face physical challenge, a fiery furnace and the lions’ den while holding true to their faith in the one true God. 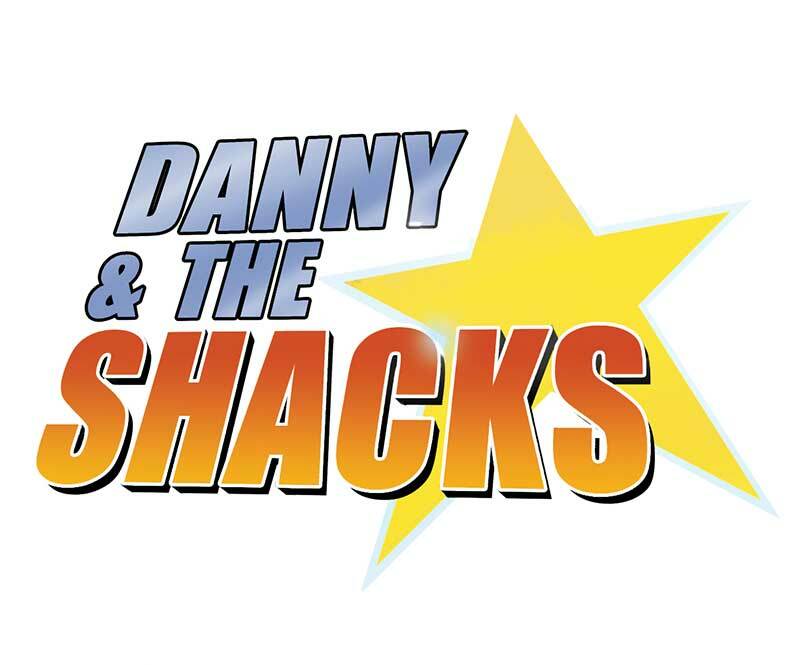 This program will be presented Wednesday Evening, April 3rd (during Logos) at 7pm in the Fellowship Hall and Sunday, April 7th, 12:15 pm (a “dinner” theatre)also in the Fellowship Hall. A ticket will be needed for admission to the Sunday program (because of meal planning requirements). See Jeannie May for a ticket. There is no charge for admission. However a Love offering will be received at the Sunday program to defray meal costs and to provide support for Trinity Puppet Ministry. In recent years, Trinity has been participating in an old Orthodox custom – that of telling jokes the week after Easter. 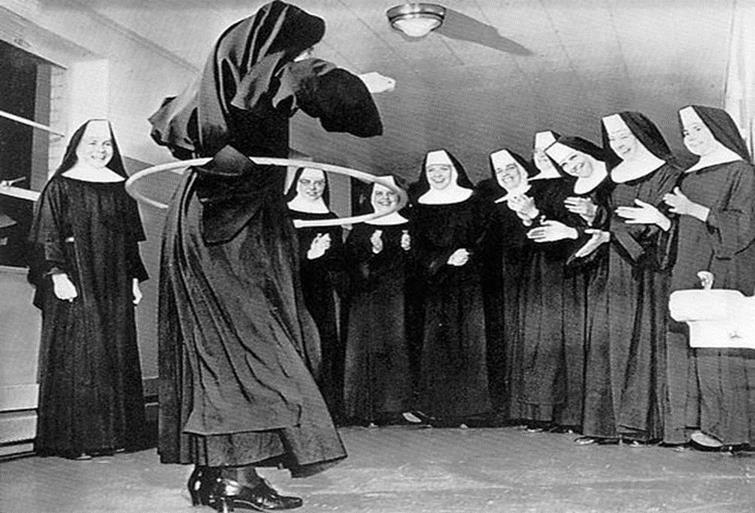 After all, the Resurrection was the biggest practical joke on the Devil that there ever was; and if you can’t have a good belly laugh about life after the Resurrection, you’ve probably got the wrong end of religion! 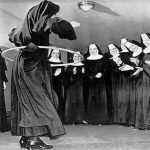 So Sunday, April 28 will again be Holy Hilarity Sunday here at Trinity, and there’s no telling what to expect during the 11 am worship. Those of sour demeanor and inability to laugh at themselves had best stay home or visit another church that Sunday. However, if you enjoy a good laugh at life and believe that God has a sense of humor – and that humor is a blessing from God – we’ll save a pew for you on Sunday, April 28th! This year will be a musical Hilarity Sunday, with some fun old hymns like Turn Your Radio On and The Royal Telephone—as well as a really amazing antiphonal Logos “Thank You” conceived in the spur of the moment my the Zeisberger Table! Part of our Moravian Easter tradition is to meet each night of Holy Week (or Passion Week, from the Latin word passus, “to suffer”) and read a portion of the events of that week in Jesus’ life leading up to the crucifixion and resurrection. We sing stanzas of hymns that pertain to the readings, and use this time together to reflect upon the awesome events that were woven together by God to create the first Easter. as the candles are extinguished in the sanctuary. This impressive experiential service ends in darkness and silence following the story of the burial of Christ. Last year, we held a special experiential communion service for Maundy Thursday in the Reich Fellowship Hall. In addition to the Holy Week Readings, we experienced Holy Communion in a different way. The participants were seated in tables of twelve, and they shared the elements with one another. 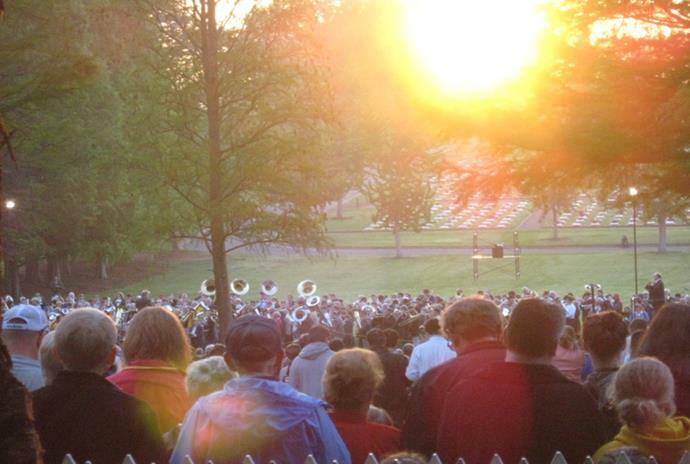 It was a profound and moving experience, and we plan to use the same kind of service this year. We hope you will plan to attend! On Easter Sunday, while it is still dark, we gather with thousands of other faithful at Salem Square to bear witness to Christ’s resurrection. 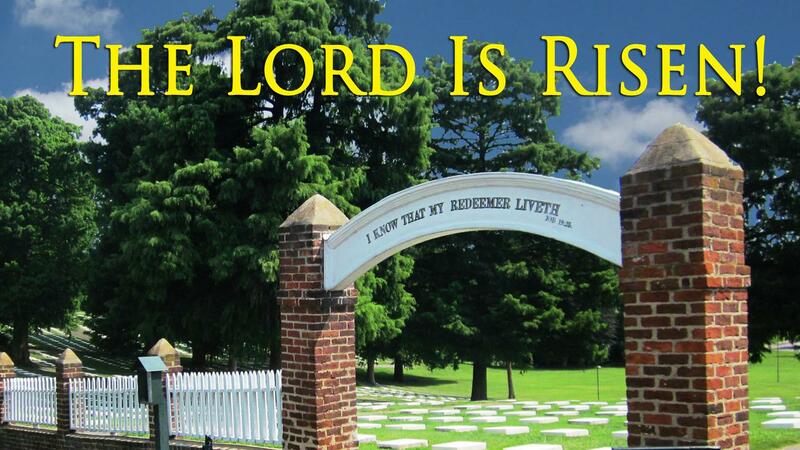 The Lord is risen indeed! Some of us will also join our brothers and sisters from St Philips at the 2nd St Philips Graveyard to join in the service from there, with audio streamed from the main section of God’s Acre. 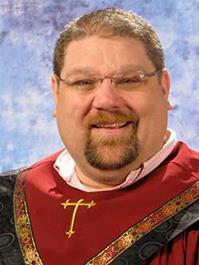 This year, the service will be led by the Rev. Chaz Snider, pastor of Ardmore Moravian Church. 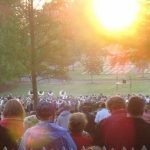 We Moravians are often called “the Easter people,” in part because of these memorable Easter sunrise services — but also because the faith of the risen Christ is central to our belief and practice. Moravians believe that in the incarnation, when God was born as a baby and experienced all of being human, something was fundamentally changed about the world — and that at the death and resurrection of Christ, the whole relationship between God and humanity was transformed. Because Christ has died, because Christ has risen, we are called to live for Him — and to show others His love through humble service. I’d like to extend a special word of thanks to all the Trinity folks who worked so hard to make Holy Week and Easter the amazing experience that it is! It takes many, many faithful workers to make everything happen. From our wonderful choirs (senior and Logos) to our Holy Week readers; from our ushers, dieners, and band members to all the faithful folks who decorate the sanctuary and the graveyard; to those who organize and participate in the amazing Cross Walk. All of you know who you are, and I know that you work so hard because of your faith — but I want to thank you for that faithful work! Each year the European Continental Province makes arrangements to draw watchwords for the individual Provinces, Mission Provinces, and Mission Areas. Check out our new Trinity Moravian website, which should go live around March 1. The new layout is “responsive,” which means it is designed to display well on a mobile device such as a tablet or phone — over half the views of web sites now are on a mobile device. Our old web site, designed for the 2012 Centennial, displayed well on a computer screen but was very difficult to navigate by phone. In addition to the change in layout, there are important changes to content as well. If you use a Google Calendar on your phone (most of us do! ), you will be able to click on event on the church calendar and add it as an event to your personal calendar. We plan to include a number of short videos of members talking about Trinity, as well. Br. Jonathan Sidden, who has served as our music director for the past 12 years, has accepted the position as music director at Clemmons Moravian Church. He will start there in March; his last Sunday with us will be March 3. We have all enjoyed the amazing music the choir has performed under his leadership, and of course we will miss his operatic tenor voice! During his tenure, Trinity has seen a re-voiced organ, new choir robes, the reconfiguration of the choir loft, a sanctuary redecoration, a new piano in the choir room, a Centennial celebration, and he has introduced new traditions and countless new favorite anthems in services. 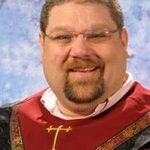 Brother Sidden, our prayers and best wishes go forward with you as you start this new phase of music ministry at Clemmons! Oscar Hernandez will continue as our organist.